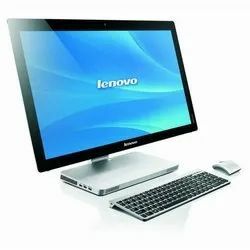 Owing to the expertise we have gained in this realm, we have brought forth a wide gamut of Lenovo Desktop. Available with us in a consignment of configurations, these provided desktops are broadly recommended. Super-slim, borderless 23" all-in-one The Lenovo Ideacentre AIO 510S is as compact and lightweight as it is elegant. It features a widely adjustable, 23 inch borderless infinity, multitouch display with improved processing power. Add to that discrete graphics and immersive stereo sound, and this all-in-one is the perfect solution for no-hassle entertainment.